A few weeks ago, Intermitten hosted our third tech conference focused on highlighting and nurturing the Midwest as both a hub of and destination for entrepreneurial thought leadership and talent. And while this wasn’t our first rodeo, we did a number of things differently this year. One of those was hosting the event in Detroit so that we could build meaningful bridges between the Ann Arbor and Detroit ecosystems. Another change was that the conference was one day instead of two, in order to make it more accessible for those who can’t take so much time away from other life priorities. But the biggest change this year was our speaker lineup: we had all women speakers, and most of them were women of color. The biggest aha! moment for me in planning Intermitten this year is that people in tech don’t know how to contextualize all women speakers in a tech conference lineup. Not wanting to seem self-congratulatory or make the conference exclusively about women, we didn’t announce that we were making space for all women speakers or even comment on it at length. Rather, we quietly posted our speakers’ information with a heading that said, “This is a conference for everyone who works in tech. These speakers are the thought leaders we chose for this event.” Despite that heading and the fact that we deliberately didn’t advertise our speakers’ genders and ethnic backgrounds, people saw our all women speaker lineup and thought our tech conference was either a women’s or diversity conference. Whenever I heard or saw a comment like this, I thought, “I’ve looked at tech conferences for well over a decade now, and the number of times I’ve seen all men in a speaker lineup and thought it was a men’s conference or anything other than a tech conference is, gee, approximately zero times.” The fact that an all male (and often all white male) lineup is so normal to us and that the reverse is so abnormal to us is why we nervously but deliberately made this choice. I certainly expected people to be startled by seeing all women and so many women of color. I also expected having to say that fostering inclusion requires swinging the pendulum far back in the direction of the underrepresented in order for us to find an equilibrium someday. But what I didn’t expect is that this would be so out of the ordinary and that the gap of understanding would be so wide that folks’ brains would instinctively fill the gap with a different explanation altogether. This put into perspective to me just how important it was to keep going. To help drive high-quality programming, all Intermitten speakers commit to a Talk Development Program. It’s the primary mechanism through which we thread themes across different talks, ensure that talks don’t become redundant, and curate them so that they all build on one another. The Intermitten Talk Development Program requires speakers to do things like send us talk drafts, hop on phone calls, read our emails, etc. It’s the only way we can have a good pulse on our programming and make suggestions for things to focus on or not, within the context of all the other talks. It’s a big commitment, but I was still surprised to find that this year’s engagement in the program was lower than ever — and not for lack of caring. These speakers more than ever wanted to do practice runs of their talks before the event. It was the most humble group we’ve had — not a single diva! But the hard truth is that they struggled to keep up this year. At first I worried that we were doing something wrong, but then I realized: These women are hustling harder. Some of them are single-handedly running their businesses. Some are doing that while also being mothers and/or the heads of their households. Some of them are traveling constantly, wherever and whenever they can, in order to build their brands. In several cases, these speakers work multiple jobs to support their dreams. Despite hearing this so many times before — and experiencing it as an entrepreneur myself — working closely with an all women speaker lineup enabled me to see the contrast between speaker cohorts and fully grasp that these underserved and underrepresented folks are working a lot harder to build and maintain the same success that those more privileged have. One of my concerns about having all women speakers, most of whom are women of color, was that we would deter men — especially white men — from attending the event. That was the last thing I wanted to do. The underserved and underrepresented are not going to make change in isolation; we also need those with privilege and power to create space for us. Much to my delight, this didn’t happen. In fact, this was by far the most diverse group of attendees we’ve ever seen at Intermitten. We had people from different ethnic backgrounds, different age groups, the LGBTQ community, different professions, and different socio-economic backgrounds and locations (some folks drove 9 hours through the night to attend Intermitten and drove back when it was done to get to work in time the next day). 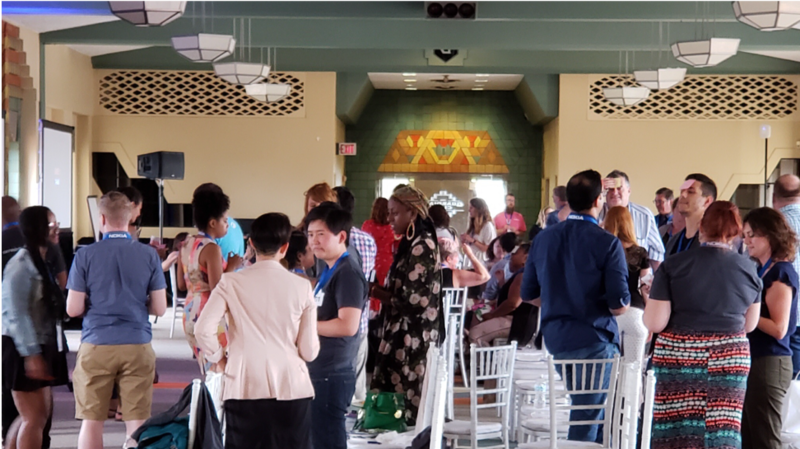 The event was so diverse that diversity and inclusion consultant Nikki Pardo called me the next day and asked how we did it, because she’d never seen a conference get it so right (probably the highest compliment we could have received). I’m confident that this was accomplished through our speakers and representing people who aren’t often represented at a tech conference. But what I’m most relieved about was that the men still showed up, and we only had slightly fewer men than women. Pause a moment; did you catch that? There were more women than men at a tech conference. I’m pretty sure we broke a record. More important, however, is the key takeaway: having all women, mostly women of color, in a tech conference speaker lineup resulted in a really diverse group of attendees who were ready to learn, contribute, and grow in tech. Do we have room to improve on this at Intermitten? Absolutely. This work doesn’t end. But I think we’ve at least found ways to move the needle in the right direction, and I can’t wait to do more. P.S. If you’re interested in speaking at Intermitten someday, subscribe to our newsletter below for updates. And if you’re interested in either volunteering your time to help increase diversity at conferences or want some help learning how to pitch a talk, check out Represent.